Part of the weasel family, skunks are known to be problematic critters. Most people have never seen a skunk in broad daylight, but when they do, it is, unfortunately, an encounter they won’t forget. Similar to raccoons, skunks are omnivorous but eat a plethora of other items, which has led to them become more prevalent in urban areas. When skunks feel threatened, they release a powerful odour as part of their defence mechanism. Although this is what they’re most famous for, it’s important to note that, usually, there will be some warning signs that precede. The first sign that a skunk feels threatened is when they stomp the ground and shake their tail. Sometimes, this is accompanied by a growling noise or spitting, as well. Skunks have strong forefeet and nails, making them excellent diggers. Many homeowners have problems with skunks digging under porches, sheds, or even in garden beds. When they are digging, they are usually looking for food, but sometimes they are also looking to create a burrow. These burrows are usually used as a place to raise young and hide from predators. Skunks are most prevalent in the summer and spring seasons, as they tend to be fairly inactive in the winter months. Most skunks will have a litter of young anywhere from April to June. In most cases, it’s pretty easy to know if you have a skunk problem. You’ll be able to identify this mainly be their smell. The odour is described as foul and often leads to burning or watering eyes upon contact. If you’ve been sprayed by a skunk you will be able to smell the odour for weeks, if not months. This is because the spray settles into other areas of your home, such as carpets, curtains, and other upholstery. Some say you can smell a skunk from kilometres away, but more realistically it’s a distance of 3-5 metres. The odour from a skunk that’s passed away is even more pungent and tends to last longer. If you smell a consistently strong odour around your home, chances are there’s a skunk infestation. Another way to tell if there’s a skunk burrow near your home is if you see any skunk activity. February is mating season for skunks, so they are most often seen around this time of year. Upon identifying you have a skunk problem, it’s important to take action in order to prevent future damage. 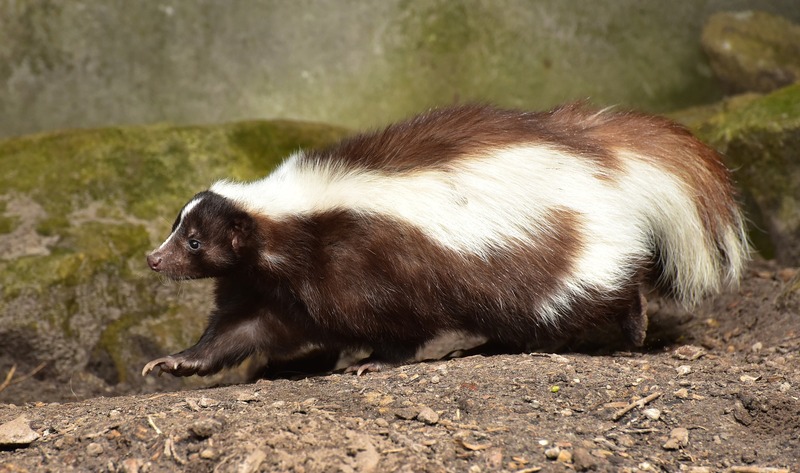 A skunk infestation is one of the most serious wildlife infestations because of the damage it causes in terms of its smell. Handling an infestation on your own is a dangerous endeavour. That’s why it’s important to contact a wildlife control company who know the right techniques to humanely remove the infestation. The best way to prevent a skunk infestation in the first place is by sealing off any areas where they are likely to burrow. At Raider Wildlife, we’re committed to providing wildlife removal solutions that are effective and humane. To learn more about our services and to speak with a pest control specialist, call 1-844-482-7243!